That’s right the one and only MC from Chicago is back at it on the music tip,Reap. Now I go wayyy back with Reap to his freestyle battle days, and this is one dude not to mess with, he has bars for days. These last couple of years he has been focusing his vision on the music video directing tip and photo shoot tip. But now he has hit the booth again and is gearing up for his newest album release “I watch OTHERS change MY world” and is firing out the gate with the first single titled “Never Told Me feat Gabriel” and a music video was just release as well to back his single. The video is directed by Sense Hernandez for Beast Factory Films and it come with a strong message that any Guy or Girl can relate to. 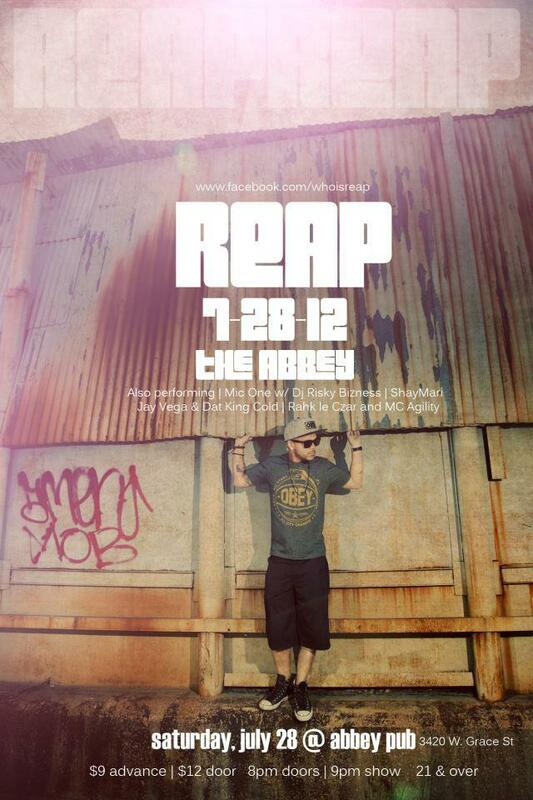 Peep the video below and be sure to share with your friends if your felling it, and for those who are local, Reap will be hitting the stage this Saturday here at the Fame Chicago venue “The Abby” peep the flyer below as well for more info, it is one show that you do not want to miss out on because it is sure to be history in the making. Be sure to check out!!! !